Grey Hand Press is a collaborative editioning studio and publisher of fine art prints, based in Brisbane, Australia. Collaborative printing practice allows artists to produce images in specific print mediums by working with master printers. 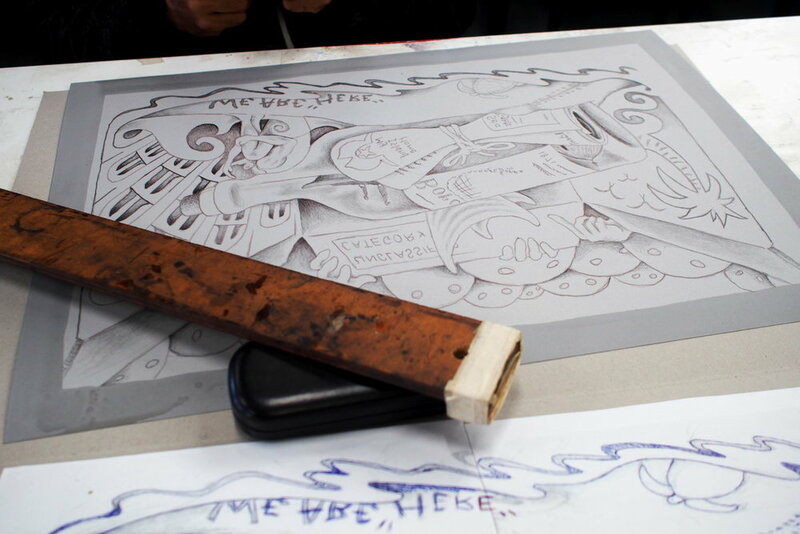 We specialise in lithography (stone and aluminium), book arts, and intaglio (etching, aquatint, drypoint, mezzotint). Located within the brand new Northgate Workstores precinct on Brisbane’s northside, the studio conducts workshops in-house as well as hosting guest instructors to teach masterclasses and specialised techniques. Our printers are also available to teach select classes at other venues throughout the region. The two traditional models for collaborative printing projects are publishing and contract printing. In publishing projects, a studio will invite artists to create a new edition of original prints. The studio covers all costs and in exchange, retains half of the final prints for sale and exhibition. The artist retains the other half of the edition for their own sale, distribution or exhibition. Contract printing (or 'custom' printing) is typically initiated by an artist who approaches the studio with the desire to create a series of prints in their chosen print medium. In this case, the studio only keeps a few of the prints for their own collection and exhibition, and the artist receives the entire edition. Working with a collaborative print studio has benefits for many types of artists - printmakers and non-printmakers alike. Artists who work in other mediums such as painting, drawing, sculpture, design and digital media are able to produce work in a new medium guided by the expertise of the studio printers. Many artists who are already experienced printmakers themselves will often approach an editioning studio to create a suite of work in a print medium outside of their current oeuvre. This allows artists to create work in an exciting new medium, without the expense or inconvenience of learning the method themselves. Sign up with your email address to receive news and updates on workshops, artists and exhibitions. Thank you for signing up! You will receive an email shortly confirming your subscription. Grey Hand Press acknowledges the Jaggera and Turrbal peoples, the traditional custodians of the land on which our studio is situated. We pay our respects to elders past, present and emerging.